Is Southern Conservatism Just Plain Old Racism? As events in Ferguson continue to dominate public political attention, it’s worthwhile to take a step back and take a long hard look at how we got here. Why did the Democratic “Solid South” of old become such a stronghold of Republican strength? Lyndon Johnson, one of the smartest Southern politicians ever, had no doubt in his mind — “There goes the South for a generation,” he reportedly said, after signing the Civil Rights Act in 1964. But the South was already halfway out the door at the time. Missouri, with a fair amount of Southern culture in its veins, is nonetheless a border state, home to Harry Truman, whose enunciation of a civil rights agenda, followed by integration of the armed forces and strong civil rights platform in 1948, led to the walkout of the Dixiecrats, which cost him a dramatic 20 percent drop in the share of the Southern vote from where it had been in 1944. That launched a transitional era that is strangely lost to most who ponder such things today. This lack of longer historical memory is part of what helps to support a popular brand of revisionism that claims the South turned Republican because the people there embraced “principled” “small-government” conservatism. There are numerous problems with this explanation. First, if that’s why the South changed, then why didn’t the shift happen earlier? Second, if the change is explained by gradual economic development (as some such as Real Clear Politics senior analysis Sean Trende have argued), then why did Herbert Hoover do almost as well in 1928 as Dwight D. Eisenhower in 1952? And why did the Democratic share of the Southern vote drop precipitously by 20 percent in 1948, as noted above, the year the Democrats put a civil rights plank in their platform, and the Dixiecrats walked out? Third, what exactly is meant by “small-government conservatism”? And how does that square with the fact that Southern states almost universally get far more money from the federal government than they send in by way of taxes? And finally, how to explain the findings in a2005 paper by Nicholas Valentino and David Sears, which found that “whites residing in the old Confederacy continue to display more racial antagonism and ideological conservatism than non-Southern whites,” and that “Racial conservatism has become linked more closely to presidential voting and party identification over time in the white South”? The year after the March on Washington, pioneer pollsters Lloyd Free and Hadley Cantril conducted surveys that were the basis for their 1967 book,The Political Beliefs of Americans; a Study of Public Opinion.They found that those opposed to five forms of federal spending were three times as likely as those who supported the spending to think that blacks should have “less influence” in politics. Since blacks only had five representatives of Congress at the time—just over 1%, compared to 11% of the population—the notion that they had too much influence was ludicrous on its face—and clearly racist. Yet, that’s precisely what 60% of those ‘small government conservatives’—people like Rand Paul and the Tea Partiers—believed. The federal government is interfering too much in state and local matters. The government has gone too far in regulating business and interfering with the free enterprise system. Social problems here in this country could be solved more effectively if the government would only keep its hands off and let people in local communities handle their own problems in their own ways. Generally speaking, any able-bodied person who really wants to work in this country can find a job and earn a living. We should rely more on individual initiative and ability and not so much on governmental welfare programs. Free and Cantril found that while half of all respondents qualified as ideological conservatives, two-thirds qualified as operational liberals, a condition they referred to as “mildly schizoid, with people believing in one set of principles abstractly while acting according to another set of principles in their political behavior.” It’s not that everyone held contradictory views, of course, but the contrast in dominant modes was certainly a mass phenomenon, not just an individual quirk. More precisely, almost a quarter of the respondents, 23 percent, were both ideological conservatives and operational liberals. What’s more, this percentage doubled in the handful of Deep South states that Goldwater carried that year. This is a point well worth digesting: The vanguard states in terms of realigning from Democrat to Republican were the ones with a sharply higher number of people who were ideological “small government” conservatives in principle, but who supported social spending in practice. It’s only natural that these are the sorts of people whose views were likely to change dramatically based on the situation, but who then turn around and explain themselves in terms of unchanging “principles.” After all, this is what they were already doing in 1964. But that’s not the main point I want to make here. Because so many ideological conservatives were operational liberals in practice, it’s not a helpful way to look at who the true believers really are. The true believers are the ones who actually opposed government spending in practice. They are the ones who didn’t just say they supported conservative principles in the abstract; they applied those principles to their spending priorities as well. Hence, if you want to know who the principled conservatives really are, you don’t look at the expression of principles in the ideological spectrum, but at the support for social spending in the operational spectrum. And this is where you see the sharp differences I described in the passage quoted above: 60 percent of those who were completely operationally conservative thought that blacks had too much political power in 1964, compared to 20 percent of those who were completely operationally liberal. It couldn’t be clearer: Small government conservatives are much more opposed to black political power than those who support big government. “improving and protecting nation’s health,” “improving the conditions of blacks,” and “improving and protecting environment.” Two of these items can be expected to be directly influenced by attitudes toward blacks — welfare and “improving the conditions of blacks” — but since America’s welfare state does disproportionately benefit blacks in some ways, it would be unrealistic to exclude such questions. However, we’ll take a somewhat different look later, below. There is no single GSS question that’s comparable to the question that Free and Cantril asked, but there are questions related to blacks’ ability to live their lives as they wish, which is arguably the most basic form of political power there is. Can blacks live and go wherever they want to? Or do they need the permission of whites? There are at least three GSS questions that bear directly on this, and all tell a remarkably similar story: those who are less willing to let blacks live as they want to are also much more likely to be “small government conservatives,” while those who support black autonomy are much more supportive of big government. 15.9 percent to 9.0 percent for RacSeg; and 16.4 percent to 9.1 percent for RacPush. There was also one GSS question related to formal political power — but it was of limited usefulness. Even fairly early on, people were extremely reluctant to say they wouldn’t vote for a black president. Only around 10 percent would say that over the decades. So the samples are very unevenly split. But the basic pattern remains the same: 21.5 percent of those who wouldn’t vote for a black president are small government conservatives who would cut social spending program, compared to 11.2 percent of those who say they would vote for a black president. Only 4.7 percent of those who wouldn’t vote for a black president would increase social spending on six or seven items, compared to 13.3 percent of those who say they would vote for a black president. Attitudes toward black political power are clearly an important component of racial ideology in America. But perhaps even more basic is the view of basic worthiness. Do blacks continue to be poorer than white Americans because of external barriers holding them back, or because of their own inner deficiencies? A two-factor attitude measure found that those giving all internal answers — saying that blacks didn’t face discrimination, but simply lacked the will to succeed — were much more likely to be small government conservatives: 17.3 percent of them supported decreasing government spending programs, compared to just 4.5 percent of those who gave all external explanations. In contrast, those giving all internal explanations were far less likely (5.4 percent) to support increased spending on six or seven items than those giving all external explanations (22.4 percent). Now, as I already noted, the questions I used included two that were likely to directly reflect attitudes toward blacks. But what would happen if those were replaced with quite neutral spending questions — questions about spending on mass transit, and “highways and bridges”? I won’t go through the whole battery of questions this time; it’s enough to just look at the question of whether internal or external factors are to blame for blacks’ lower economic status. With this new battery of seven spending questions, 8.2 percent of those blaming blacks would reduce spending, compared to just 2.9 percent blaming external conditions, a smaller proportion for both, but a relatively comparable ratio between them. There was more significant convergence on the other end of the scale, but the differences were still quite noticeable: 12.1 percent of those blaming blacks would increase spending on six or seven items, compared to 18.3 percent of those blaming external conditions. Taken all together, this seems to clearly show that some of the opposition to government spending is directly tied to spending that targets blacks, but that some of it does not; it is simply correlated with negative assessments of black worthiness. But how general is this finding? I’m not prepared to give a comprehensive answer, but I can give you a bit of a surprise: When it comes to spending that would help combat the impacts of global warming, attitudes toward black worthiness turn out to be quite important. I created a three-item spending scale related to global warming — one question we’ve already seen, “improving and protecting environment,” one concerning spending on science, and one specifically on developing alternative energy. For this three-item scale, the differences are just as dramatic as for the first seven-item scale. 17.5 percent of those who blame blacks would cut spending overall, compared to just 5.8 percent of those who blame external conditions. And 30.7 percent of those who blame external conditions would increase spending on all three items, compared to just 16.3 percent of those who blame blacks. Thus, even when it comes to fighting global warming, one’s attitudes toward blacks are a strong indicator of how much of a “principled conservative” one is likely to be. Some “principles,” eh? European countries are much more generous to the poor relative to the U.S. level of generosity. Economic models suggest that redistribution is a function of the variance and skewness of the pre–tax income distribution, the volatility of income (perhaps because of trade shocks), the social costs of taxation and the expected income mobility of the median voter. None of these factors appear to explain the differences between the U.S. and Europe. Instead, the differences appear to be the result of racial heterogeneity in the U.S. and American political institutions. Racial animosity in the US makes redistribution to the poor, who are disproportionately black, unappealing to many voters. American political institutions limited the growth of a socialist party, and more generally limited the political power of the poor. The paper itself is a sophisticated consideration of multiple factors and possible explanations, but I want to just focus on two charts the authors presented. Both involve comparisons between social spending and the presence of racial minorities. The first is a country-level comparison comparing social spending as a percentage of GDP with “racial fractionalization,” which the authors describe as “the probability of randomly drawing out of the country’s population two individuals that do not belong to the same racial group.” It showed a visible correlation between a larger presence of racial minorities and a lower level of social spending. 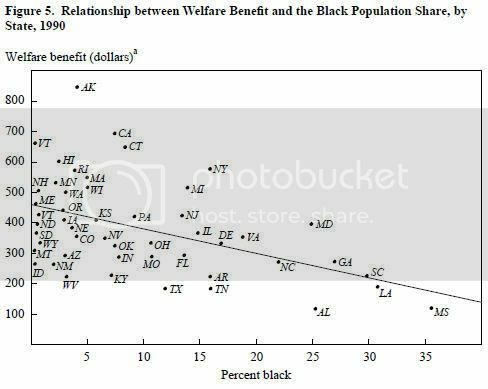 The second chart is a state-level comparison between the size of welfare benefits and the percent black. It shows a similar correlation. In the years since this paper was published, a broader literature has appeared. A 2011 survey of that literature “Ethnic Diversity, Public Spending, and Individual Support for the Welfare State” concluded that the evidence was “mixed,” though “many studies do show evidence of a negative association.” It also speculated that future research would probably reveal that “the relationship is most likely non-linear: ethnic diversity will matter most near a ‘tipping point’ at which ethnic minorities are perceived as posing a political or economic threat to the native majority.” It also needs to be stressed that racial antipathy is just one factor to be considered. Just because one empathizes more readily with those one sees as coming from a similar racial or ethnic group does not necessarily mean one is hostile to other groups. Generally speaking, the more genuinely self-confident and happy people are with their place in the world, the more open they are to welcoming others. So in-group identification and out-group hostility are two related, but distinguishable phenomena. But the GSS questions explored above should leave little doubt that racial antipathy is part of the mix supporting the politics of “small government” “principled” conservatism. By the end of 1963, with segregation losing its stable respectability, he [Wallace] dropped the word altogether from a fresh stump speech denouncing “big government” by “pointy-headed bureaucrats,” tyrannical judges, and “tax, tax, spend, spend” legislators. He spurned racial discourse, calling it favoritism, and insisted with aplomb that he had never denigrated any person or group in his fight for local control. So, there’s nothing new in the claim that “principled conservatism” has nothing to do with race. If you want to be a true believer, it’s the very first lie that you have to believe. Next postWill Ferguson be a moment or a movement?